This memorial website was created in memory of our loved one, Gennaro J Morelli, 87, born on November 13, 1913 and passed away on March 4, 2001.
to show all important data, death records and obituaries absolutely for free! Share Your Memories and Sympathies and Join the Bereaved! (removed) Why we show it? Where Gennaro J Morelli is buried? 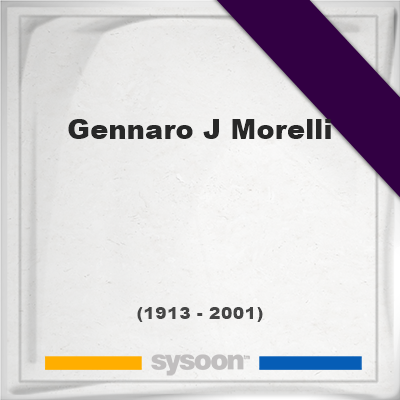 Locate the grave of Gennaro J Morelli. How Gennaro J Morelli died? How to find family and friends of Gennaro J Morelli? What can I do for Gennaro J Morelli? Find relatives that had become lost over the years and decades. Join a discussion and talk to others in the Sysoon community. Data collected by GINN / Akropola s.r.o. Write a brief biography of the deceased and present it to the world. This can be a wonderful, heartwarming experience for all. The Social Security Death Index includes over 200 million citizen death records. Enjoy free access to the most up-to-date SSDI search for individuals with International Social Security numbers. Search the SSDI online for free now or subscribe for access to billions of other genealogy records. Note: Do you have a family photo of Gennaro J Morelli? Consider uploading your photo of Gennaro J Morelli so that your pictures are included in Gennaro J Morelli's genealogy, family trees & family history records. Sysoon enables anyone to create a free online tribute for a much loved relative or friend who has passed away. we are preparing more information. Followers are people who receive the updates and information about the deceased person. Address and location of Gennaro J Morelli which have been published. Click on the address to view a map. Gennaro J Morelli has records at: 02143, United States. What is: Memorial QR Code? Print memorial QR code here. Every Memorial Website celebrates the legacy of a life. Many people choose to share their Memorial Websites in Sysoon’s Featured Memorial Website Program. Sysoon is a free resource for finding the final resting places of famous folks, friends and family members and contains listings for thousands of celebrity graves, making it the premier online destination for tombstone tourists. With millions of names, it's an invaluable tool for genealogist and history buffs. Memorials are rich with content, including dates, photos and bios. You can even leave virtual flowers on the memorials you visit to complete the online cemetery experience.